On 8th August 2015, Saudi led coalition airstrikes destroyed 8 homes in the village of Shara'a in Radhma district in the governorate of Ibb, Yemen, killing 8 civilians including 2 women and 3 children, and wounding at least 2 more. 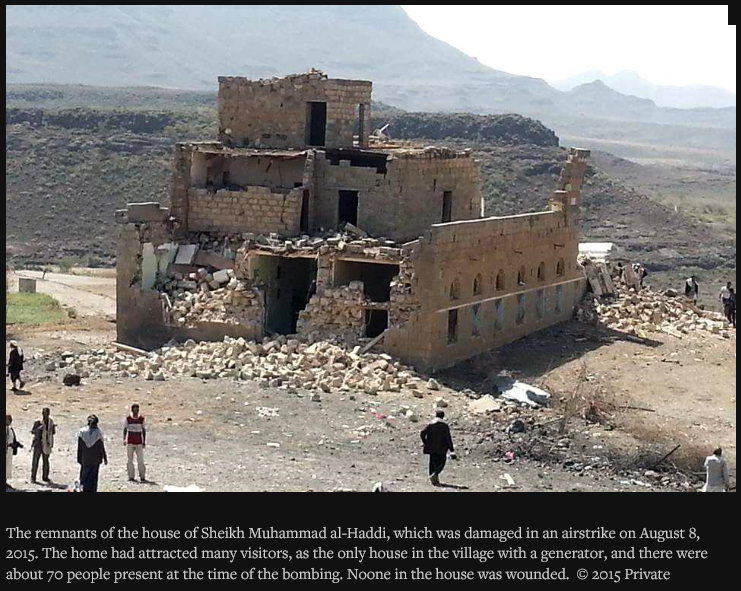 On August 8, starting at 8:30 p.m., coalition aircraft dropped five bombs in the span of several minutes, destroying eight homes in the village of Shara`a, located in southern Ibb governorate’s Radhma district. The village has a population of about 800 people. The strikes killed eight civilians, including three women and three children, and left at least two civilians wounded. The al-Salam military base, which was occupied by Houthi forces, is located two kilometers (1.2 miles) from the village. Although the base was apparently not struck, 10 minutes before bombs hit Shara`a, two strikes hit the Al-Ahram event hall, located next to the base. "The first strike that hit the village targeted my house. I ran out to see what had happened, despite being injured. But two minutes later, my cousin’s house was hit by a second bomb. Then minutes later, two more fell, one on my house again, and a fourth on my cousin’s house again." "I never expected to see something similar, people running around and crying. It was horrific. We were trying to pull some of the people out the rubble when two minutes later another bomb fell and sent us running." The following news report from that time states 8 were killed and 14 injured in the incident.